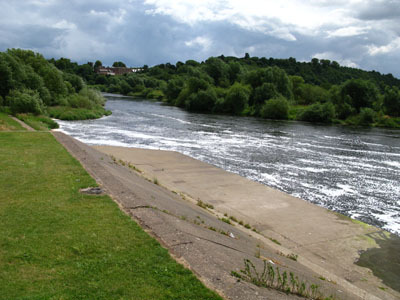 Just over 1 1/4 miles of fast, shallow water downstream of Beeston Weir. Chub and Barbel are the dominant species directly below the weir with some Roach and Dace further downstream. The weir pool is also noted for Pike.Please note that this water is now Members Only. Night Fishing is allowed with a Night Permit. Closed Season 15th March to 15th June Inclusive. From the A52 Dunkirk roundabout take the exit for Beeston Road/University Boulevard and continue for 1 mile, at the roundabout turn left into Queens Road and continue for ¾ mile to the traffic lights and turn left into Station Road. Continue along Station Road and into Meadow Lane for ¾ mile, at the hump back bridge bear right into Canal Side. Continue along Canal Side for 500 yards. Parking is in surrounding roads. Access to the river is over the canal using the footbridge close to the locks.